Stressed out by tax season? Chill out with a 99¢ chili dog from Wienerschnitzel! The fast food chain has reduced the price of its iconic chili dogs through April 27. Also, Saturday (April 5) through Monday (April 7), Wienerschnitzel is lowering the price of its three family combos from $9.99 to $6.99. Claremont’s Vom Fass has posted its schedule for April, and it includes its popular wine, cheese and chocolate pairing event, as well as a new wine event. The wine, cheese and chocolate pairing event takes place from 7 to 9 p.m. Thursday, April 24. The evening includes a collection of wines presented by Regal Wines, paired with an assortment of cheeses from Claremont’s Cheese Cave and delicious handmade chocolates from the Chocolate Angel. 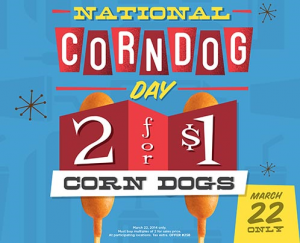 Today (March 22) is National Corn Dog Day and corn dog fans can get a terrific deal just by heading to Wienerschnitzel. 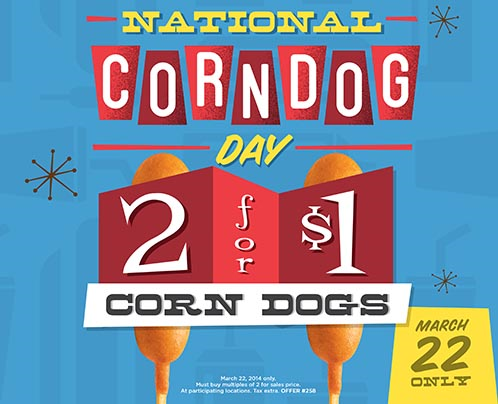 Today only at participating Wienerschnitzel locations, you can get two corn dogs for just $1. One for you, and one for your sweetie. Or, maybe just two for you. A Hawaiian pizza is the latest weapon in the fight against cystic fibrosis. 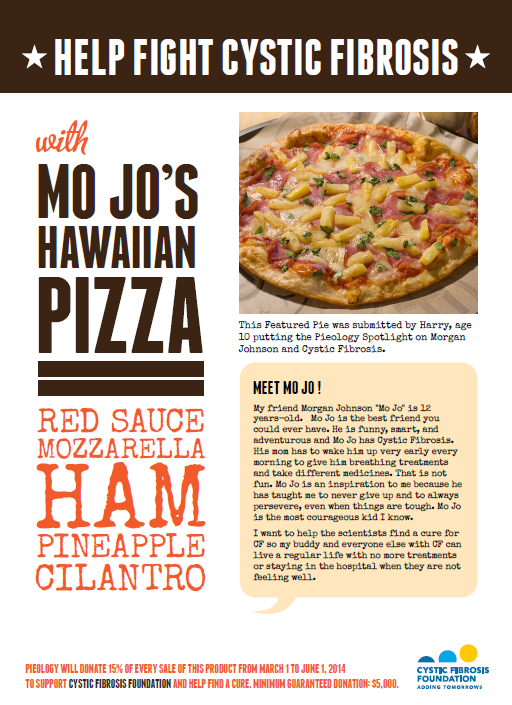 The pie, a creation of a 10-year-old named Harry, is made with red sauce, mozzarella, ham, pineapple and cilantro. You see, Harry’s friend, Morgan Johnson, 12, is battling the disease. Pieology Pizzeria is using Harry’s pizza to raise funds to help his friend and other folks in the same situation. 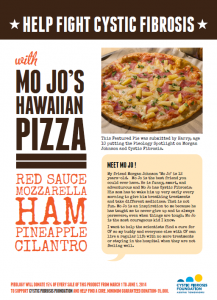 Through June 1, Pieology is donating 15% of all sales of Mo Jo’s Hawaiian Pizza to the Cystic Fibrosis Foundation. We’ve mentioned it before, but it’s finally here! 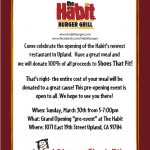 The first-ever Inland Empire Restaurant Week begins today (March 21)! A total of 60 restaurants from 20 different communities across the I.E. and beyond are participating in this inaugural event. Those restaurants are giving diners a chance to sample several courses from a special discounted prix fixe menu. Lunch prices are $10, $15 and $20, while dinners cost $20, $30 and $40. We’ve been tracking the progress of several new eateries in Upland’s Colonies Crossroads, with Panera Bread, Pick Up Stix and Chipotle opening in recent months. The latest is just about to open. 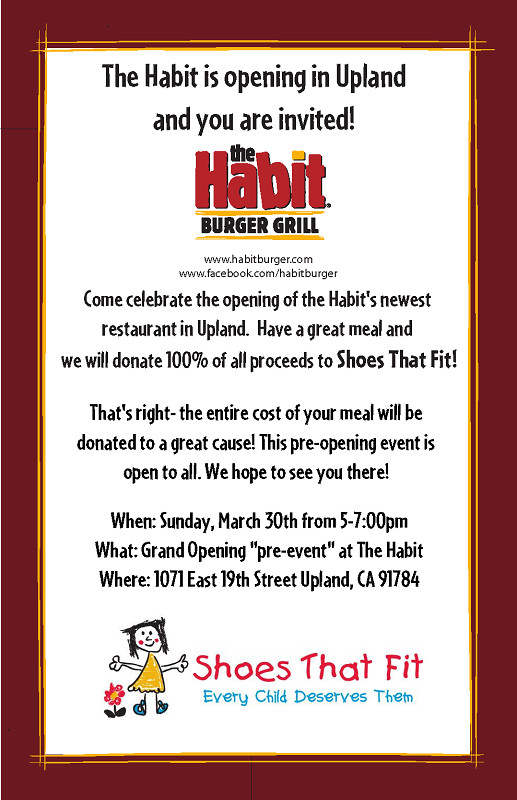 The Inland Empire’s newest Habit Burger Grill will officially open to the public at 10:30 a.m. on April 2, but the restaurant will host three fundraisers before that date. Although National Chip and Dip Day is Sunday (March 23), Rubio’s Chip and Dip Day is being celebrated on Friday (March 21). At participating locations, guests will be able to purchase an order of guacamole and chips for just $1 on that day. No coupon is needed, but as per usual, the offer can’t be combined with other discounts. Inland Empire Rubio’s locations include Rancho Cucamonga, Redlands, Ontario, Chino Hills, Adelanto, Riverside, Hemet, Norco, Corona, Palm Springs, Palm Desert, La Quinta, Murrieta and Temecula. We’re in the midst of the Lenten season, but you don’t need to step foot in any church to find that out. All you have to do is drive past any fast food outlet. As is an annual tradition, fast food restaurants are advertising their seafood offerings, hoping to reel in customers who are eschewing meat on Fridays. The whole family can satisfy their sweet tooth at Saturday’s Take the Cake Bake Off Saturday (March 15) at San Manuel Stadium, 280 S. E St., in San Bernardino. Sixty bakers are expected to bake cupcakes, cookies and cake pops for the event, which is being produced by Redlands’ Cakewalk Cake & Candy Supplies. 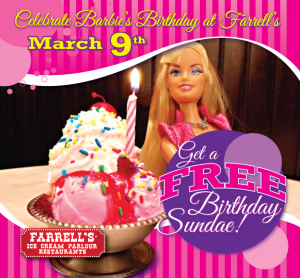 It will run from 11 a.m. to 3 p.m.
Farrell’s Ice Cream Parlour restaurants are celebrating the iconic doll’s birthday with a daylong celebration on Sunday (March 9). Guests are invited to join Barbie and Ken from 10 to 11 a.m. at Farrell’s (except Santa Clarita, sorry) for a Barbie-inspired Zoo sundae, filled with 30 scoops of ice cream. After singing a special birthday song to the guest of honor, the Zoo will be shared with the young guests (12 years old and younger) in attendance.